McDonnell Tower Apartments and the tower and townhomes at River Park Place in Southfield are getting a $19.8 million makeover. The Southfield Nonprofit Housing Corp., in partnership with Southfield-based Larc Community Development Group, worked on behalf of the City of Southfield to secure tax credit funding and a construction loan through the Michigan State Housing Development Authority to renovate the properties, located at Civic Center Drive and Berg Road. “The vast renovation and restoration of McDonnell Tower and River Park Place is an outstanding example of how public and private partnerships can help create and preserve quality, affordable housing for low and moderate income residents in Southfield,” says Mayor Kenson J. Siver, and board president of the nonprofit. McDonnell Tower Apartments is an 11-story apartment building that includes 162 units for seniors 62 years of age and older. The River Park Place Apartment complex offers 245 affordable rental housing units, including 182 units for seniors 62 and older, and an additional eight family townhomes. 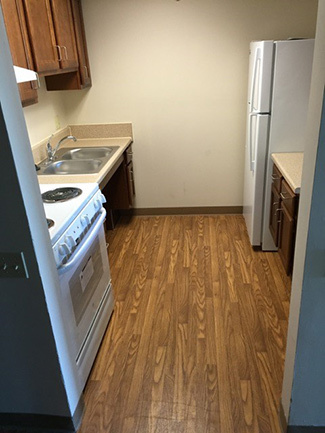 Construction on McDonnell Tower and River Park Place began in August 2015 with a renovation budget of $37,000 to $40,000 for each of the 407 units. Silver says McDonnell Tower Apartments and River Park Place Apartments and Townhomes will offer modernized, energy efficient and affordable rental housing options. To date, electrical upgrades have been completed, exterior windows and new roofs have been installed, as well as heating and cooling systems, including hot water tanks. Kitchen upgrades include new cupboards, flooring, appliances and lighting, and a fire suppression system above the stove. Bathrooms have received new lighting fixtures, ceramic tile flooring, high-rise low-water-use toilets, new emergency pull cords, bathtubs with “walk-in” feature, and sinks equipped with vanities. Current renovation work includes common areas such as activity rooms, lobbies, hallway doors, carpeting, and elevators. To accommodate residents with limited mobility or who are wheelchair dependent, approximately 25 apartments are being converted into handicap accessible units. These units have wider doorways and “roll-in” showers. The handicap units will also be designed with lever handle doors to balconies, rather than sliding doors. Once all 407 units have been rehabbed, the next phase of renovations will include hallways, common areas, meeting rooms and parking lots. Security systems, including cameras in hallways, lobbies, parking lots and more, are part of the planned upgrades.